Angela Langford Skincare is a boutique luxury natural and organic skincare beauty brand, handmade in Britain from a little lab in Somerset, England. This range of natural skin care products does not use parabens, petrochemicals, sulphates or artificial colours or fragrances. The product range makes use of the best natural and organic ingredients and includes cleansers, exfoliators, toners, serums, oils, balms and moisturisers. If you love to take lingering showers or long soaks in the bath, then you could try their body products including body washes, shower gels, body scrubs and creamy body butters. I am pleased to let you know that Angela Langford is offering 3 lucky readers of this blog a chance to try out some skincare samples from their range. The 'Skin Care Sample Pack' will include a range of products specially selected by Angela Langford to suit your skin type and condition. 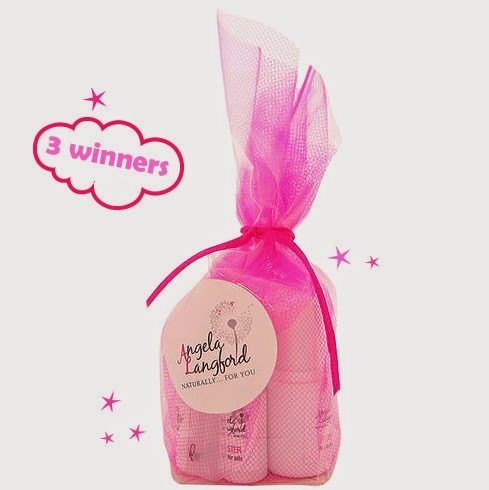 All you need to do(if selected as a winner) is to send you skin details/concerns to Angela and she will select the relevant products from her range for you to try. Entry is using the Rafflecopter form below. All the best! I'd like to try it because I love discovering new products that might help my ultra dry skin. I would love to try Angela's products as they are completely natural and organic and she uses no nasties to make them - they sound fab! I love testing out new products and this sounds fab!